The JBL 4425 is a Constant Directivity horn loudspeaker system designed by Greg Timbers. It’s based of the larger 4430 and 4435 systems that were designed by David Smith. All of these systems utilize Don Keele’s famous 2344 or 2342 Bi-Radial Horn, oftentimes referred to as ‘Dolly Partons’ or ‘Baboon butts’. The 4425 combines this with the 2416H compression driver. Don Keele was responsible for the first Constant Directivity horn designs while working at Electro-Voice from 1975 through 1979. These were then loosely copied by Altec Lansing for use in the Mantaray series horns. When Don arrived at JBL he began work on a Constant Directivity program that would aid in the future development of these systems. The first result of his efforts was the JBL 2344 Bi-Radial Horn. Keele mated a JBL-style diffraction horn to a secondary horn consisting of exponentially curved sides derived by using two radial formulas. This resulted in a hybrid Constant Directivity horn that was free from the distortion components associated with abrupt angle changes. Unfortunately, the Bi-Radial design had problems with apparent apex and arrayability in the same manner as Altec’s Mantaray CD horns. Most popular Constant Directivity horns suffer from non-spherical wavefronts, limitations in arrayability, distortion at high sound pressure levels as well as reflections and distortions related to the transition from diffraction slot to secondary horn. They tend toward a narrowing of dispersion pattern at the higher frequencies whose wavelengths approach the width of the throat or the width of the diffraction slot. Because the CD horn’s high frequencies are more spread out over its coverage pattern, they appear attenuated relative to other horns. The CD horn requires an equalization boost of approximately 6 dB per octave with a filter knee centered between 2 and 4 kHz (depending on horn design) in order to sound neutral and balanced. Most manufacturers of active electronic audio crossovers responded to this requirement by adding an optional CD EQ boost filter or high frequency shelf filter. Further refinements of the filtering process are available in DSP-based crossovers such as the dbx DriveRack PA2 . The limitations of these systems should not be over-blown by audiophiles. By bringing out the facts regarding loudspeaker design we hope to illustrate that perfection is unobtainable with currently available technologies. Both JBL’s 4425 and Altec’s Model 14 are excellent monitors by any standard, and will meet or exceed the expectations of most audiophiles, when properly setup. 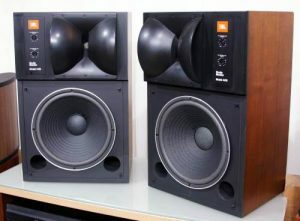 For low frequency output the 4425 uses JBL’s 2214H Aquaplas treated woofer. JBL states the frequency response of the system is 40 Hz to 16 kHz +/- 3 dB, and the sensitivity as 91 dB 1 Watt at 1 m.
Click here to view the original sales brochure for the JBL 4425.